TACOMA, WASH.- Tacoma Art Museum announced a major donation by Erivan and Helga Haub and family of 280 major works of American Western Art along with a contribution for a new 10,000 square foot wing to house the collection as well as endowment funds for the care of the collection. The new wing will be designed by award-winning architect Tom Kundig of Olson Kundig Architects; Olson Kundig Architects is also leading the museum's plaza redesign project . This will be Tom Kundig's first completed museum project, set to open in 2014. "We are extremely grateful to the Haub family for this extraordinary gift, the largest in the museum's 75-year history," said Stephanie A. Stebich, Director of Tacoma Art Museum. "The 280 works from noted artists will make our museum a key destination to view American Western Art." This significant donation of iconic works will transform Tacoma Art Museum into one of the leading museums in the country featuring American Western Art. The museum will be the only Pacific Northwest institution to hold a collection of this caliber, and in turn will provide an entirely new dimension of cultural offerings to Tacoma as well as the state of Washington and the Pacific Northwest. Albert Bierstadt, Departure of an Indian War Party, oil on board, 17-1/4"x 24-1/4"
"This collection ranks among those of the highest breadth and caliber in American museums today," said Peter H. Hassrick, retired museum director, curator, and American and Western art scholar. 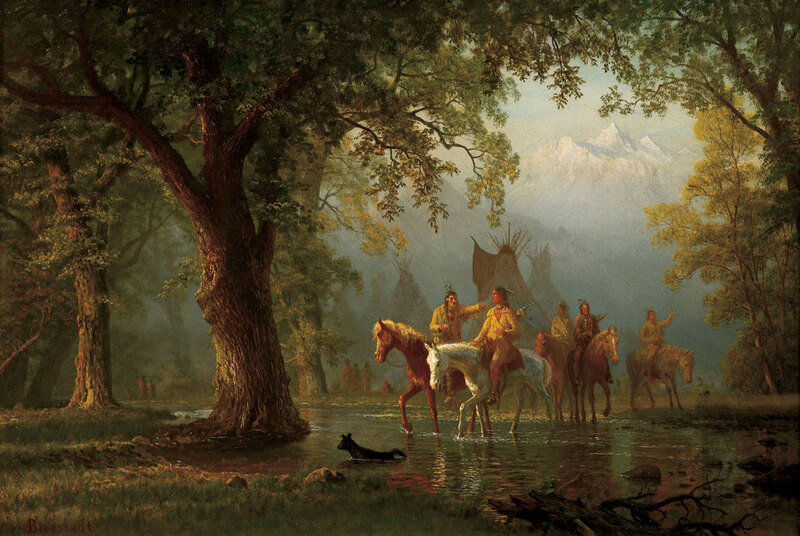 "Western art as a genre has added much to the overall development of American art over the past 150 years. The Haub collection represents a remarkable esthetic contribution as well as a fascinating historical narrative." Peter Hassrick has advised both the Haubs and Tacoma Art Museum on shaping this extraordinary gift of art, building funds, and endowment support. Erivan and Helga Haub began collecting American Western art in 1984, and have since amassed one of the most important collections in private hands. Their passion for the West has helped shape their artistic choices, which chronicle the land, people, wildlife, and history of the great American West. The collection features outstanding works that capture the spirit of the American West including the work of significant historic Western painters, such as grand manner landscape painters Albert Bierstadt and Thomas Moran; titans of Western genre, Frederic Remington and Charles Russell; as well as works by artists such as E. Martin Hennings and Ernest Blumenschein. The collection also contains works by notable modernist painters, including Georgia O'Keeffe, as well as more contemporary artists such as John Clymer, Tom Lovell, Bill Schenck, and Clyde Aspevig. The works range in date from the 1820s to the present. Originally from Germany, Erivan and Helga Haub have had close personal and business ties to the Pacific Northwest and specifically Tacoma, where their three sons were born. Their family business, The Tengelmann Group, is an international company with diversified retail and investment operations in Europe and North America. Their love and passion for the American West inspired the Haub family to become fervent collectors of American Western Art over the last 30 years. Peter Hassrick is a writer and independent American art scholar who focuses on the American West. He lives in Wyoming, and serves a national and international constituency of museums as a guest curator. He is the Founding Director Emeritus of the Charles M. Russell Center for the Study of Art of the American West at the University of Oklahoma in Norman, Oklahoma. He is also the Director Emeritus of the Petrie Institute of American Western Art at Denver Art Museum and Director Emeritus and Senior Scholar at the Buffalo Bill Historical Center in Cody, Wyoming. Hassrick's devotion to the history and art of the American West has inspired numerous exhibitions, lectures, and a couple dozen publications that he has produced throughout his career.